Baghdad, Iraq (CNN) -- At least 18 people have been killed and 80 injured in a car bomb blast in central Baghdad as deadly violence returned to the streets of the Iraqi capital for a second day. The blast was caused by a suicide bomber who drove through the checkpoint, toward a government forensic office, Iraq's ministry of information said. Tuesday's attack followed three vehicle bombings near hotels in the city on Monday which killed 36 people and wounded 71 others. The latest bombings come amid concerns over security and fears of a fresh wave of sectarian violence between the country's rival Shia and Sunni factions as the country prepares for crucial national elections on March 7. 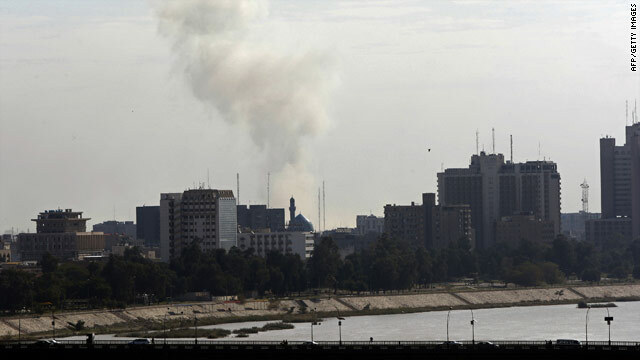 In a statement issued Tuesday, the U.S. Embassy in Baghdad condemned the attacks on the hotels. "The terrorists who committed these senseless crimes aim to sow fear among the Iraqi people. We are confident, however, that the Iraqi people will stand fast and work together to build their common future in peace and security," the embassy said.